The fourth Essex (CV-9) was launched 31 July 1942 by Newport News Shipbuildingand Dry Dock Co. sponsored by Mrs. Artemus L. Gates, wife of the Assistant Secretary of the Navy for Air; and commissioned 31 December 1942, CaptainD. B. Duncan commanding. She was reclassified ( CVA-9) on 1 October 1952,and (CVS-9) on 8 March 1960. Following her shakedown cruise Essex sailed to the Pacific in May 1943to begin a succession of victories which would bring her to Tokyo Bay. DepartingPearl Harbor, she participated with TF 15 in carrier operations against Marcus Island (31 August 1943), was designated flagship of TF 14 and struck Wake Island (5-6 October), launched an attack with TG 50.3 against the Gilbert Islands where she also took part in her first amphibious assault, the landingon Tarawa (18-23 November). Refueling at sea, she cruised as flagship ofTG 50.3 to attack Kwajalein (4 December). Her second amphibious assaultdelivered in company with TG 58.2 was against the Marshalls (29 January2 February 1944). Essex in TG 58.2 now joined with TG 58.1 and 58.3 to constitute the mostformidable carrier striking force to date, in launching an attack againstTruk (17 18 February) during which eight Japanese ships were sunk. 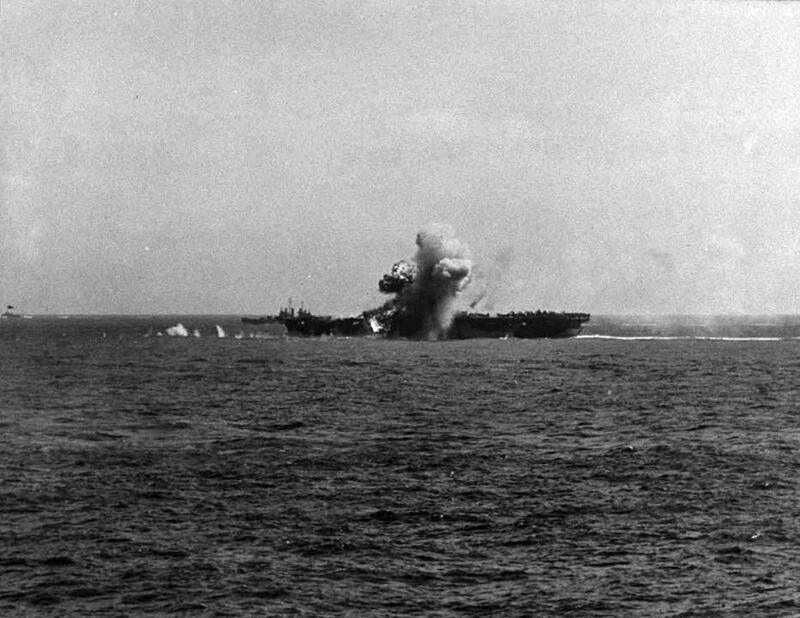 En routeto the Marianas to sever Japanese supply lines, the carrier force was detected and received a prolonged aerial attack which it repelled in a business like manner and then continued with the scheduled attack upon Saipan, Tinianand Guam (23 February). After this operation Essex proceeded to San Francisco for her single war time overhaul. She then joined carriers Wasp (CV-18) and San Jacinto(CVL-30) in TG 12.1 to strike Marcus Island (19-20 May) and Wake (23 May).She deployed with TF 58 to support the occupation of the Marianas (12 June10 August); sortied with TG 38.3 to lead an attack against the Palau Islands(6-8 September), and Mindanao (9-10 September) with enemy shipping as the main target, and remained in the area to support landings on Peleliu. On 2 October she weathered a typhoon and 4 days later departed with TF 38 forthe Ryukyus. For the remainder of 1944 she continued her front line action, participating in strikes against Okinawa (10 October), and Formosa (12-14 October), coveringthe Leyte landings, taking part in the battle for Leyte Gulf (24-25 October) and continuing the search for enemy fleet units until 30 October when she returned to Ulithi, Caroline Islands, for replenishment. She resumed th eoffensive and delivered attacks on Manila and the northern Philippine Islandsduring November. On 25 November, for the first time in her far-ranging operations and destruction to the enemy, Essex received injury. A kamikaze hit the port edge of her flight deck landing among planes gassed for take off causingextensive damage, killing 15, and wounding 44. This "cramped her style" very little. Following quick repairswe find her with 3d Fleet off Luzon supporting the occupation of Mindoro(14-16 December). She rode out the typhoon of 18 December and made special search for survivors afterwards. With TG 38.3 she participated in the Lingayen Gulf operations, launched strikes against Formosa, Sakishima, Okinawa, andLuzon. Entering the South China Sea in search of enemy surface forces, thetask force pounded shipping and conducted strikes on Formosa, the Chinacoast, Hainan, and Hong Kong. Essex withstood the onslaught of the thirdtyphoon in 4 months (20-21 January 1945) before striking again at Formosa,Miyako Shima and Okinawa (26-27 January). During the remainder of the war she operated with TF 58, conducting attacksagainst the Tokyo area (16-17, and 25 February) both to neutralize the enemy'sairpower before the landings on Iwo Jima and to cripple the aircraft manufacturingindustry. She sent support missions against Iwo Jima and neighboring islands,but from 23 March to 28 May was employed primarily to support the conquest of Okinawa. In the closing days of the war, Essex took part in the final telling raids against the Japanese home islands (10 July-15 August) . Followingthe surrender, she continued defensive combat air patrols until 3 Septemberwhen she was ordered to Bremerton, Wash., for inactivation. On 9 January1947 she was placed out of commission in reserve. Modernization endowed Essex with a new flight deck, and a streamlinedisland superstructure, on 15 January 1951 when recommissioned, Captain A.W. Wheeloek commanding. After a brief cruise in Hawaiian waters she began the first of threetours in Far Eastern waters during the Korean war. She served as flagshipfor Carrier Division 1 and TF 77. She was the first carrier to launch F2H"Banshee" twin-jet fighters on combat missions; on 16 September1951 one of these planes,damaged in combat crashed into aircraft parkedon the forward flight deck causing an explosion and fire which killed seven.After repairs at Yokosuka she returned to front-line action on 3 Octoberto launch strikes up to the Yalu River and provide close air support for U.N. troops. On 1 December 1953 she started her final tour of the war, sailing theChina Sea with the Peace Patrol. From November 1954 to June 1955 she engaged in training exercises, operated for 3 months with the 7th Fleet, assisted in the Tachen Islands evacuation, and engaged in air operations and fleetmaneuvers off Okinawa. In July 1955 Essex entered Puget Sound Naval Shipyard for repairs andextensive alterations, including installation of an angled flight deck.Modernization completed, she rejoined the Pacific Fleet in March 1956. Forthe next 14 months the carrier operated off the west coast, except for a6-month cruise with the 7th Fleet in the Far East. Ordered to join the Atlantic Fleet for the first time in her long career, she sailed from San Diego on 21 June 1957, rounded Cape Horn, and arrived in Mayport, Fla., on 1 August. In the fall of 1957 Essex participated as an antisubmarine carrier inthe NATO exercises, "Strike Back," and in February 1958 deployedwith the 6th Fleet until May when she shifted to the eastern Mediterranean.Alerted to the Middle East crisis on 14 July 1958 she sped to support the U.S. Peace Force landing in Beirut, Lebanon, launching reconnaissance andpatrol missions until 20 August. Once again she was ordered to proceed to Asian waters, and transited the Suez Canal to arrive in the Taiwan operational area where she joined TF 77 in conducting flight operations before roundingthe Horn and proceeding back to Mayport. Essex joined with the 2d Fleet and British ships in Atlantic exercisesand with NATO forces in the eastern Mediterranean during the fall of 1959.In December she aided victims of a disastrous flood at Frejus, France. In the spring of 1960 she was converted into an ASW Support Carrier andwas thereafter homeported at Quonset Point, R.I. Since that time she hasoperated as flagship of Carrier Division 18 and Antisubmarine Carrier Group Three. She conducted rescue and salvage operations off the New Jersey coast for a downed blimp, cruised with midshipmen, and was deployed on NATO and CENTO exercises. In November she joined the French navy in Operation "JetStream" and since that time has continued her widespread activitiesin protection of freedom and peace. Essex received the Presidential Unit Citation, and 13 battle stars for World War II service; 4 battle stars and the Navy Unit Commendationfor Korean war service.